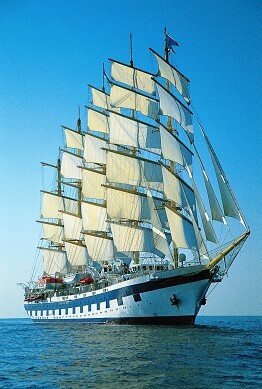 The flagship of Star Clippers' line, The Royal Clipper is the largest full-rigged sailing ship in the world and the only five-masted full-rigged ship built since the beginning of the last century. You might think she was an apparition from the grand age of sail, but Royal Clipper is as new as tomorrow, boasting state-of-the-art navigation systems and every comfort and luxury one could wish for. 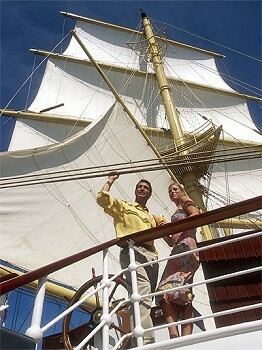 The Royal Clipper balances the grandeur, adventure and tradition of sailing with the superb service, amenities and accommodations of the finest modern yacht. 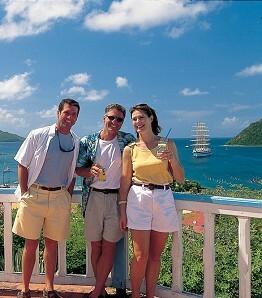 Royal Clipper carries just 227 guests in luxurious style. A full 19,000 square feet of open deck and three swimming pools create a wonderfully spacious and expansive outdoor environment. Find your secret hideaway on one of the hidden balconies on either side of the bow. Or climb the mast (with safety harness provided) to one of the passenger lookout “Crows’-nests” thoughtfully furnished with a comfortable settee, where you’ll have the grandest view of all! Royal Clipper’s interior spaces are just as dazzling. They include a 3-deck atrium that funnels sunlight into the elegantly appointed, 3-level dining room featuring open-seating, deliciously prepared cuisine and a no-tie dress code.